Security is crucial for government buildings. Government buildings like post offices, courthouses, and police stations handle sensitive information that has to be kept confidential. In the wrong hands, this information could be used to harm people and create chaos in the lives of many. Additionally, these places often house special equipment that’s expensive to replace. Protecting these environments with the proper security methods is vital for the safety of the public and the employees that work there. That’s why so many government buildings in Austin are turning to C-Bond for their security needs. 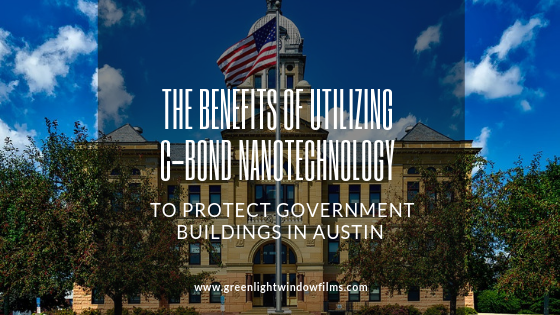 C-Bond Window Film provides Austin government buildings with a highly effective security strategy. Essentially, C-Bond is an advanced technology that offers an unconventional, yet highly effective approach to maintaining the security of sensitive and high risk environments. Created by scientists who specialize in the study of nano particles, C-Bond Systems are a highly scientific method of improving the shatter resistance of glass by altering its molecular composition. A unique priming substance enters the pores of glass and alters it molecular design, making it stronger in the process. Layers of film add extra protection so that the glass is able to resist even stronger levels of impact. The result? A security system that’s nearly bulletproof. While break-ins are certainly a concern for government buildings, they’re only the tip of the iceberg in a long list of threats that have to be considered. Government buildings are also high risk for terrorist attacks, shootings, and bomb blasts. In these environments, no vulnerability can be overlooked. Especially your windows, which are not only a risk for break ins, but also glass related injuries. By installing C-Bond Window Film for your Austin government building, you can obtain peace of mind knowing that your property is guarded from even the most serious of dangers. C-Bond Window Films offer top of the line security and can resist extremely high levels of impact, protecting buildings from traumatic events ranging from break and enters to armed robbery. Get the peace of mind you need by protecting your government building with C-Bond Window Film. Call Austin’s window film experts today at Green Light to request installation services.